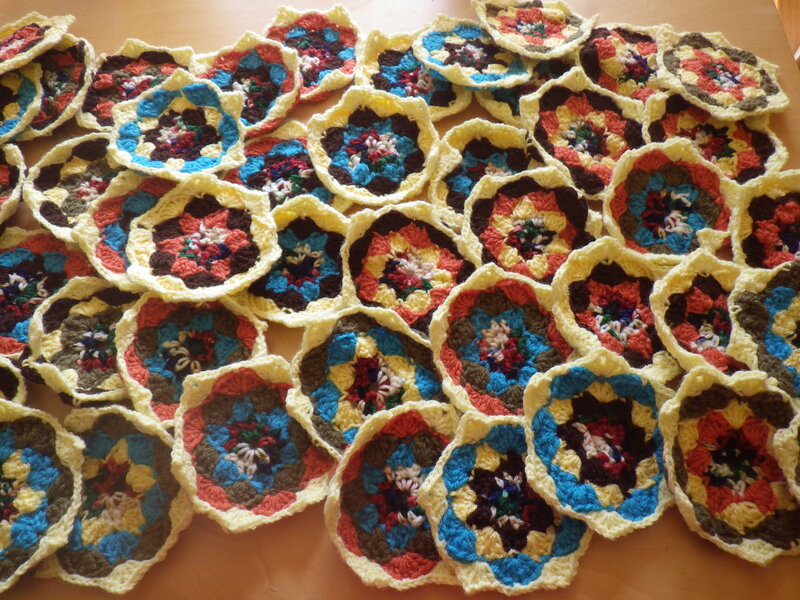 As you may know, I am currently working on a very large crochet project, namely a sofa cover. I won’t say that it’s progressing slowly, but it is such a big piece of work that it will inevitably take a long time. Originally I was simply intending to make covers for the five cushions that go along the back, but then I decided that it would be nice if I could actually cover the whole thing. I have, therefore, been considering what I need to do to create something that covers (at least most of) this large piece of furniture. I realised that I don’t want to crochet the bit that will not be seen, i.e. the part that goes under the seat cushions. This part, however, is essential as it will anchor the main cover and, if all goes to plan, ensure that crochet hooks, yarn, needles and scissors can no longer fall into the ‘body’ of the sofa, requiring me to furtle around with a torch trying to retrieve them. So, what to use? 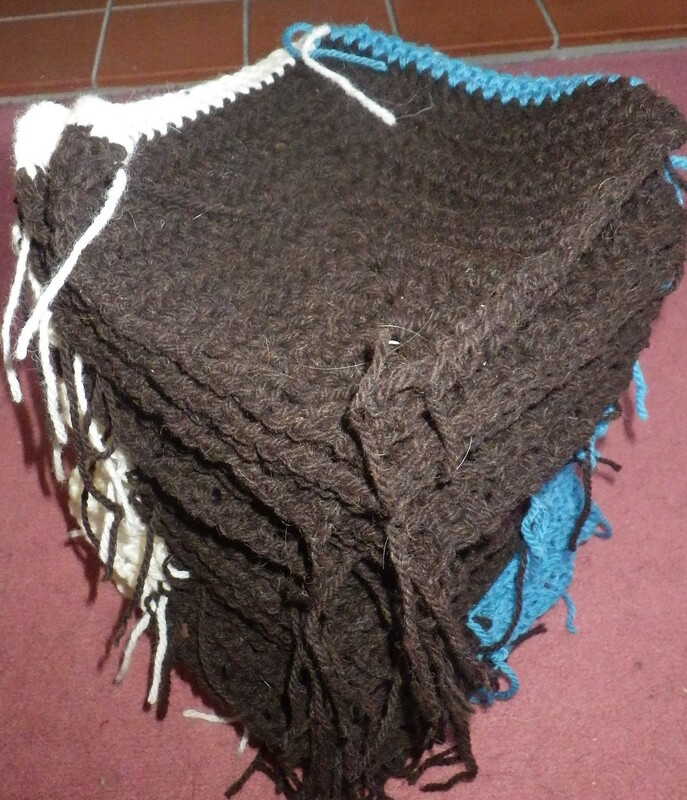 Well, in keeping with the rest of the cover, I wanted wool, leading me to the conclusion that what I need is a blanket. A blue blanket. I really want something second hand, and so, not wanting to embark on a tour of all the local charity shops, I decided to try ebay. I’m currently waiting to see if I win an auction for a pale blue, pure wool vintage blanket. A new version made by the same company as the one I’m bidding on would cost me over £80, but I’m hoping to get this one for less than £20 including postage. Once I have it, I’m afraid it’s going to be chopped up, but it will have a new and useful life, so that’s ok. The other part of the sofa that I wanted to source ethically was the buttons for the cushions. I don’t want plastic ones for this project and I really didn’t feel that wood or leather would be appropriate – both because they wouldn’t look right and because they would be just too tempting for pups to chew. 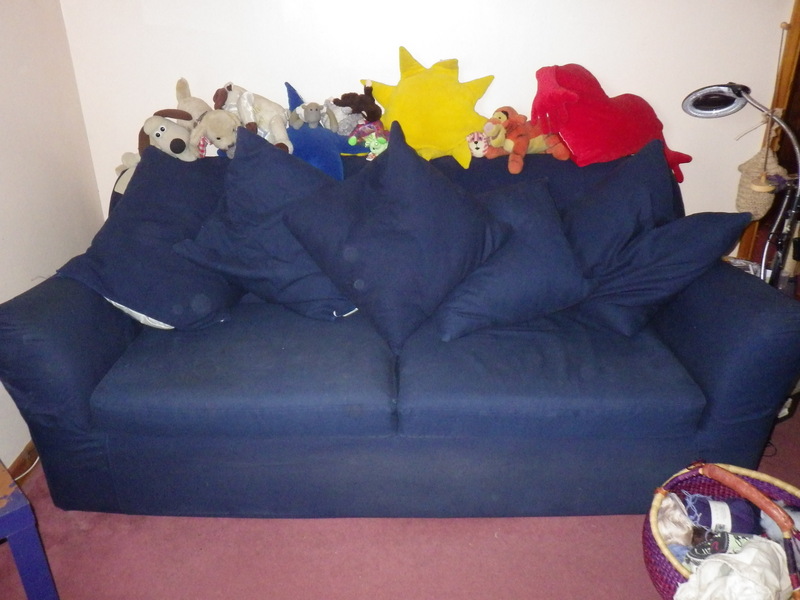 Oh and I didn’t want zips because Sam eats those too (hence the cushion inners you can see showing in the photo above). 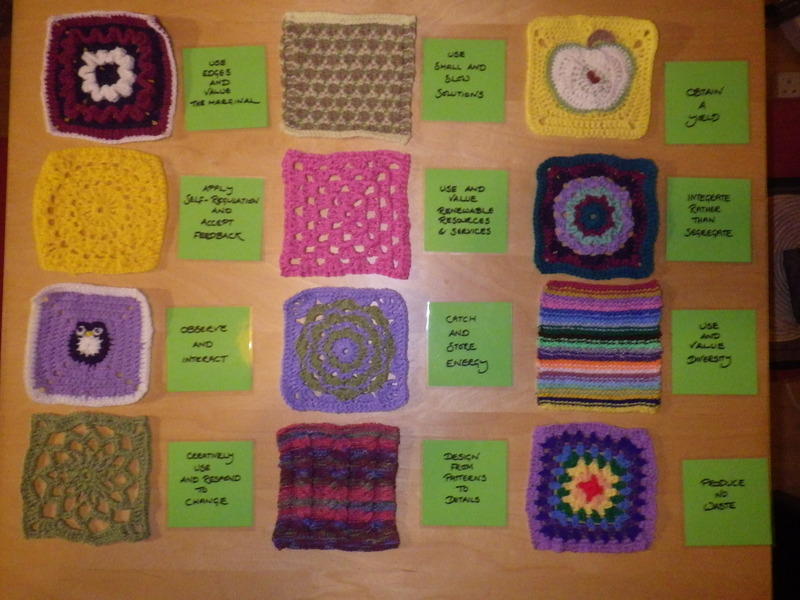 So, Joanna (who taught the course on paper porcelain) is going to make me 20 buttons… she has samples of the yarn and photos of some of the crochet and I have left the design up to her. On the crochet front, I have nearly finished the second side of the Bavarian crochet cushion cover, and the ripple cushion cover just needs constructing (because of the way I’m going to do it, I need the buttons before I can progress) and I have more than half of the squares I need for the ‘granny square’ cushion. I’m not sure what design I will choose for the next cushion cover, but possibly something stripy and then one with circles, like Kerry’s squares. All this has made me wonder what the finished sofa is going to look like. Since I now have some quite big pieces to play with, I put them together to give me an idea. This is only to provide an impression since the Bavarian crochet is for the back and front of a single cushion rather than two separate ones and the ripple piece is also for a square cushion rather than the seat, but at least it gives some idea of what the finished object might resemble… well, it’s going to be unique if nothing else! 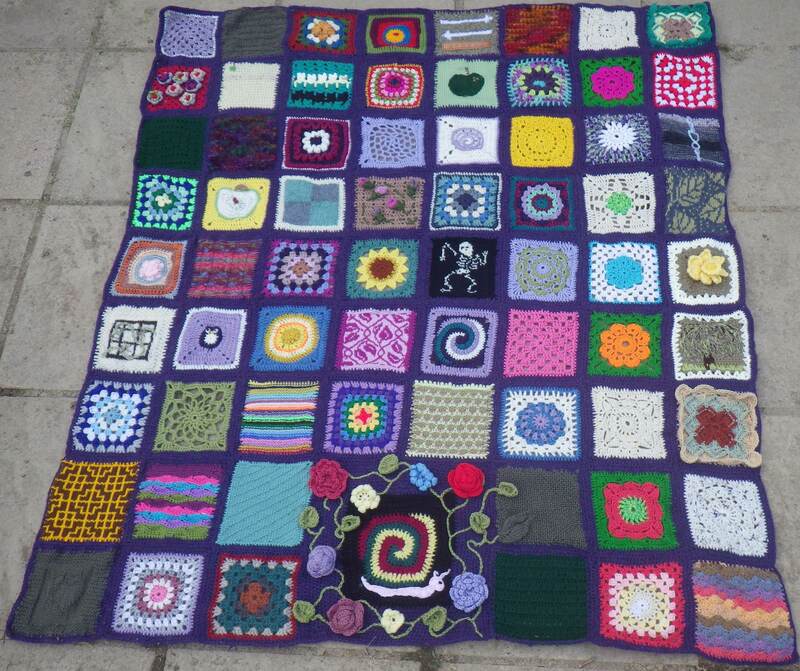 The Masterpiece is nearly complete, although I could accept a couple more squares if anyone has one to send. 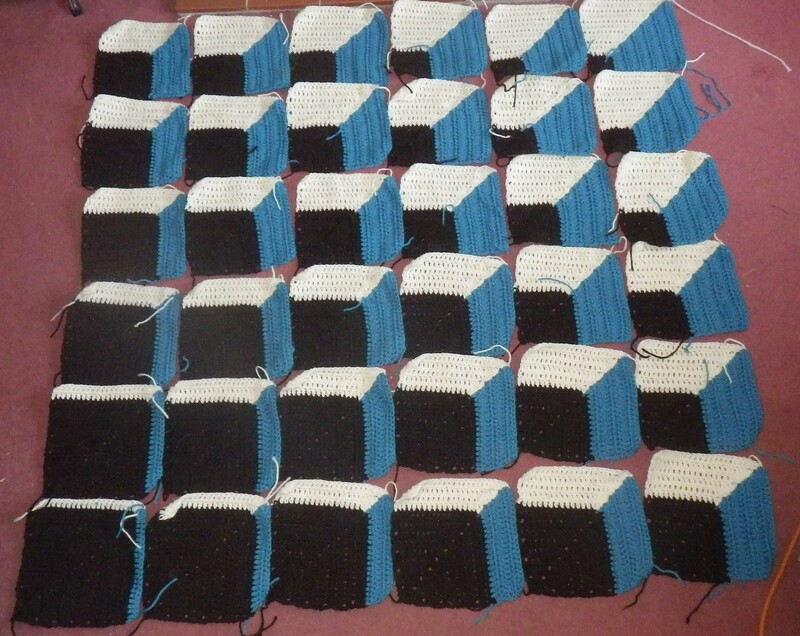 There has been a little flurry of contributions recently and so it looks like the finished blanket is going to be 9×9. 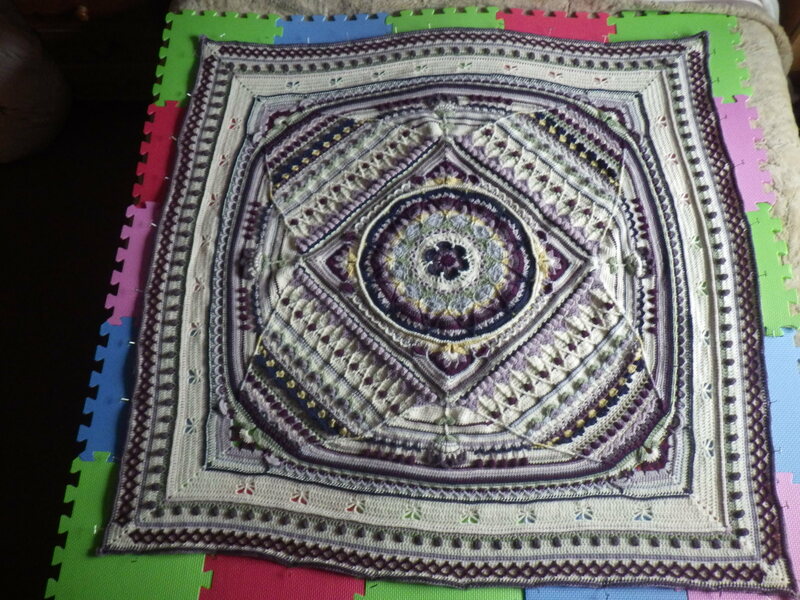 My original intention was to stitch it all together in the next couple of weeks, but I have some other work to do, so it is not going to be completed until after the middle of June (hence the leeway for extra squares). I’ve been very busy writing up my portfolio for my permaculture diploma, which explains the lack of additions to the page showing all the squares. If you have sent me one recently, I promise that it will get its own entry very soon. 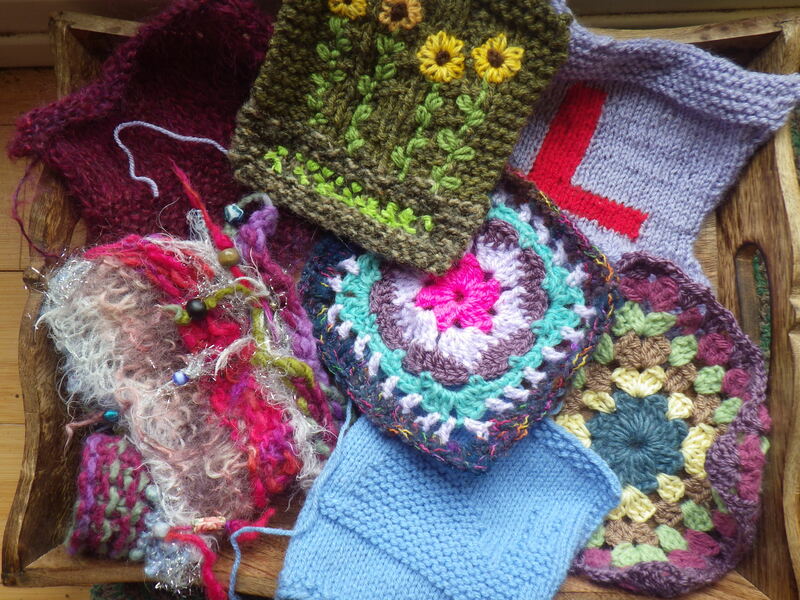 There are squares here from two fellow diploma apprentices, my tutor, two old friends, one new friend and one from Mr Snail-of-Happiness, who had to learn to knit in order to contribute! I love the variety and all the creativity that has gone into making each and every one of these. 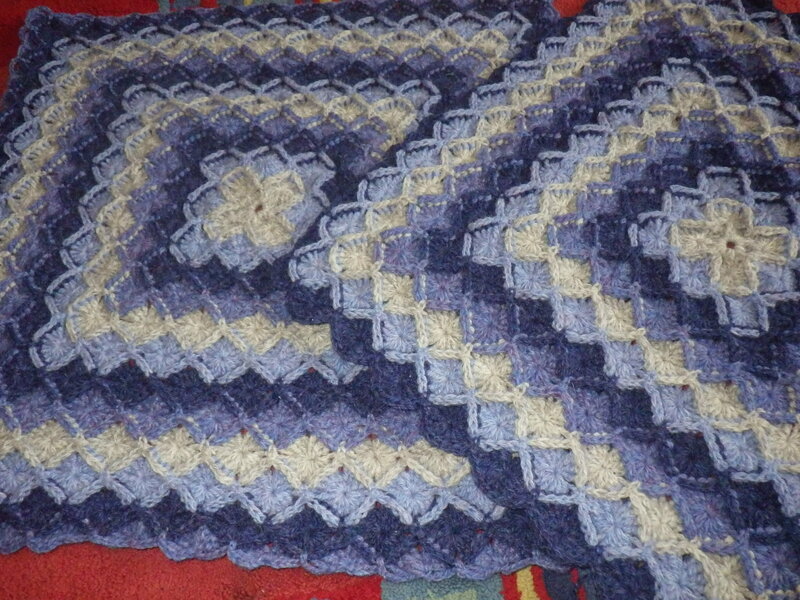 It has been a while since I posted a picture of progress on the masterpiece blanket. 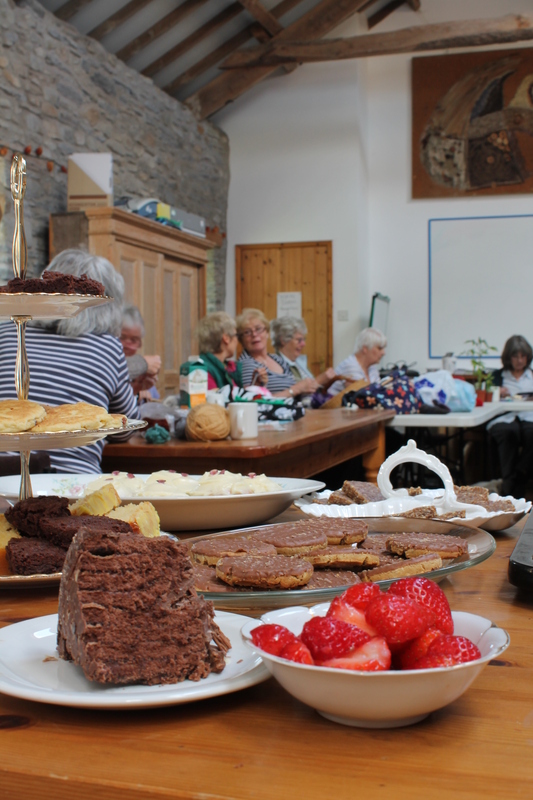 Originally Easter was my deadline for receiving squares, but one or two people needed a bit of extra time and my end-point was arbitrary, so now the final date is 20 May. So, if you wanted to contribute, but thought you’d run out of time… you have an extra month. If you do still plan to send a square or two, it would be really useful to know… just put a comment below, or drop me an e-mail. My principles are a bit woolly! You can find explanations of my thinking on my Masterpiece page, but I thought that it would be nice to show them all together. 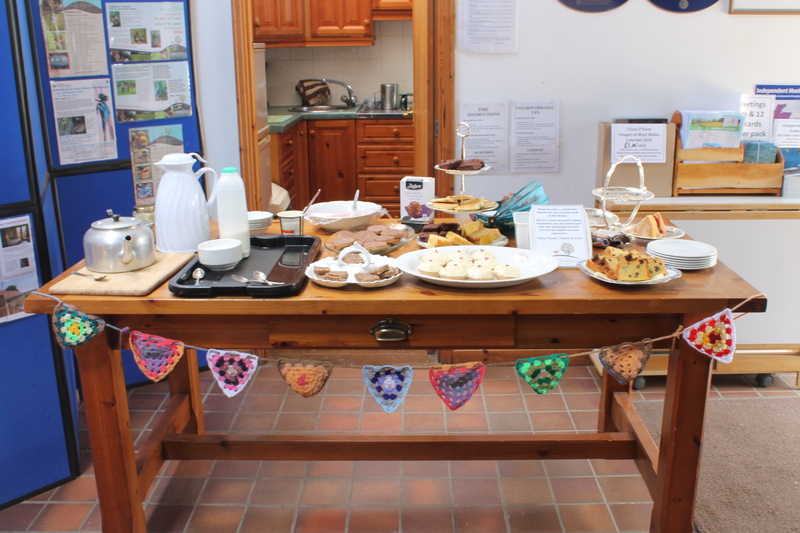 I teach an introduction to permaculture course about once a year, and last summer I was challenged to teach one completely based on knitted/crocheted props…. it looks like I’m well on my way!